Visa go. Hong Kong Super Shoppers! The Hong Kong Tourism Board, knowing there are too many people who love shopping in Hong Kong, have organized a Visa go. Hong Kong Super Shopper contest, and together with Omy.sg, have extended the contest to Singapore!!! Fashionable participants (in groups of 2) have been selected, and each group, together with 1 of 6 fashion/beauty bloggers in Singapore (yes, that's where I come in), will form a team (by drawing lots!) have to complete a fashion theme challenge as set out by the organizers. We will be given a theme, and the theme would be destinations/places in Hong Kong (e.g Kowloon, Causeway Way, Lan Kwai Fong etc. Each team will be allocated a $50 budget to create an outfit which they think best represents/suits their theme WITHIN 24 HOURS, after which they will present the outfit to a panel of judges. The blogger (me) will then write an entry about the whole teamwork process. The winning team from Singapore will get to go for a 4D3N trip to Hong Kong, and represent Singapore in the Challenge taking place from 30-31August against teams from from Hong Kong, China, and other countries to compete for the grand prize of HKD200,00 Visa spending credit!!!! VOTERS WILL ALSO GET A CHANCE TO WIN A 3D2N STAY IN HONG KONG!!!!!! Guess who's in my team!!!! I just googled them, and trust me, even when we were putting the outfit together I had NO idea they were so famous. 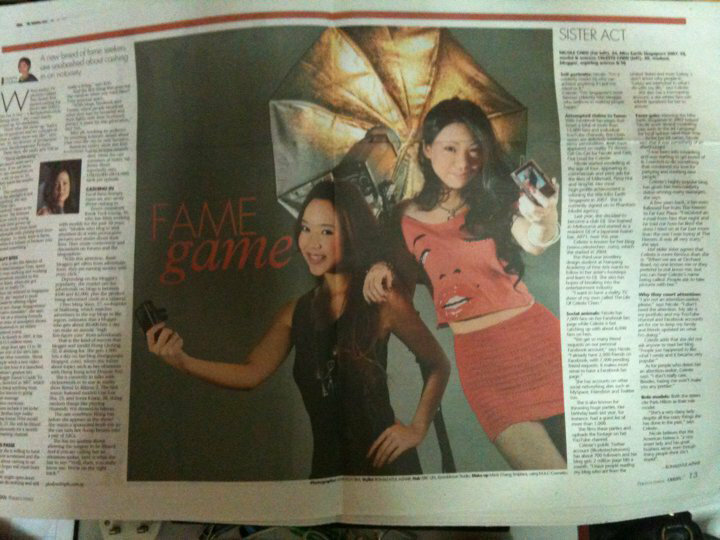 Nicole's an international celebrity model DJ, while Celeste, the younger sister, is also a model. 6 cards were presented to us, face down. We had to draw one!!!! A shopper's paradise~ Tsim Sha Tsui is one of the main shopping destinations in Hong Kong, where you can find great malls such as iSquare (located just right next to the MTR station!!!! ), Harbour City and K11. Now, how were we going to come up with an outfit that would suit the theme of Tsim Sha Tsui? To us, all Hong Kongers dress well. Do they have a Tsim-Sha-Tsui way of dressing? And if so, what does that mean? How is it different from say, Causeway Bay? I came well-prepared. While the girls were still thinking, I whipped out my iPad (brought ESPECIALLY for the discussion today. I like to be efficient. 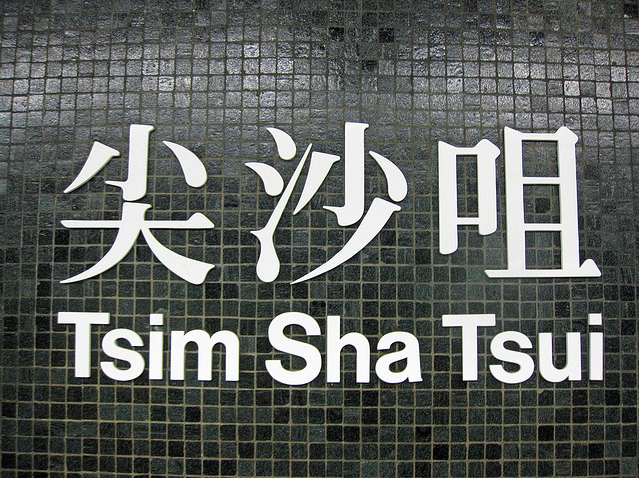 *wink*) and started googling "Tsim Sha Tsui". Voila~! Out came a long string of results. 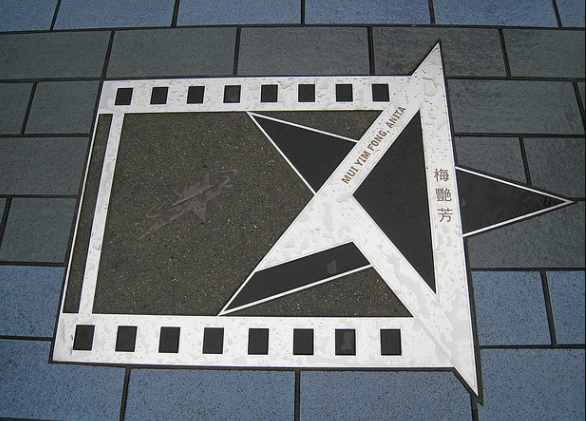 I chanced upon the words "Avenue of the Stars", and something clicked. We could do a movie star dressing, like one of the stars whose names are along the avenue at the Victoria Harbour waterfront. After some discussion, we decided it had to be Anita Mui. (It was a real pity her handprints were not on her mould.) She's one of the most iconic stars in Hong Kong, and one with great character and edge in her dress sense, especially at the peak of her career. 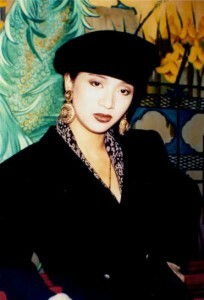 She made major contributions to the Cantopop industry, one which Hong Kong would call her own, and she was famous for being the "Madonna of Asia". 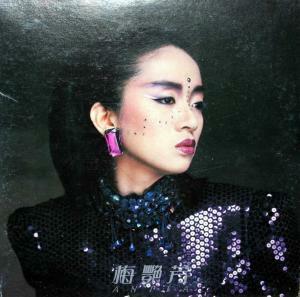 Who better than Anita Mui can we pick as the inspiration for our to-be-created outfit? 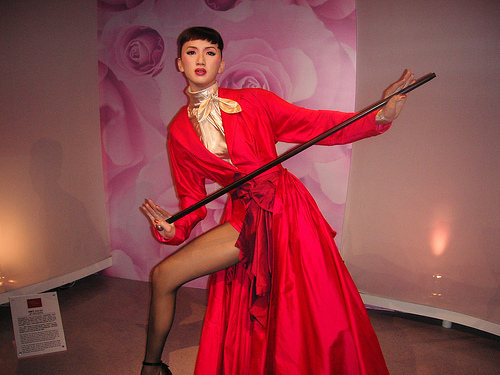 If this last outfit seems familiar to you, it was the outfit she was "waxed" in at the Madame Tussauds Hong Kong. Different outfits, yet distinctly Anita Mui. Our conclusion of her style: Edgy, always with a female touch. It could be in her red lipstick, the cut of her outfits which would accentuate her waist and legs, or her eye makeup. And there will always be a somewhat androgynous feel to whatever she pulled off. She could be womanly, yet give off the aura of the strength and 气质 (disposition) of a man. Now comes the REAL challenge: How are we going to be able to pull off that kind of style with $50????? And it's off to the trendy yet famous-for-inexpensive-clothing Bugis Street!!! Had wanted to take a picture of the famous lighted words of "Bugis Street" at the entrance of the shopping haven, but it was replaced by a huge TV screen. Anyway, if you don't know where this is (where HAVE you been??? 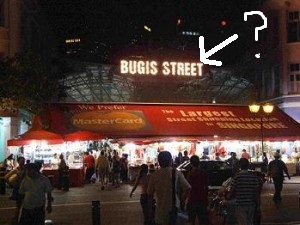 ), it's just across the road from Bugis Junction. And our sisters began their search for the perfect Tsim Sha Tsui-inspired-Avenue of Stars-inspired-Anita Mui-inspired outfit. 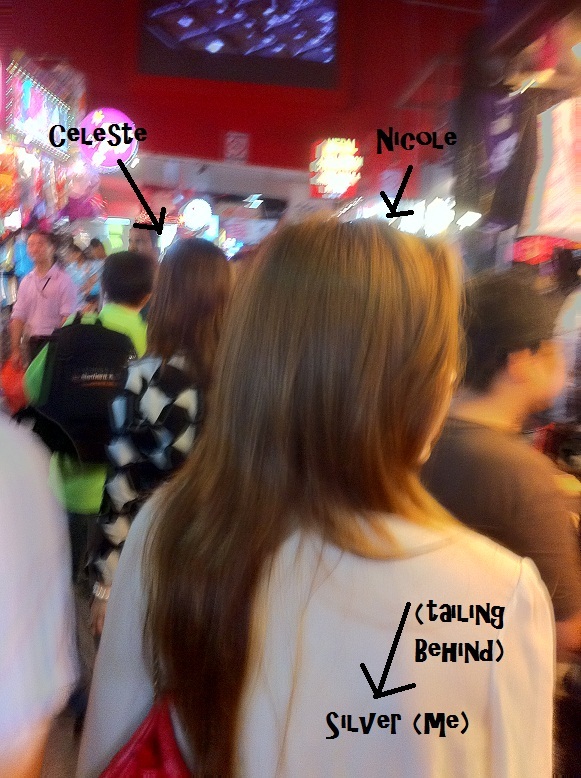 Celeste seemed to be the expert in Bugis Street - she knew every corner of the place, where to find what, and she manouvred the alleys with swift speed and ease. I was impressed. Nicole: My sister's the expert. Celeste in fitting room, figuring out how to put the pieces we chose together. We picked this corset. Half corset actually. I told Celeste to just wear a nice bra inside, with lace, so it's more edgy and statement-y. Check out the material. Pretty! "Will this go with the black skirt we chose or not?" They picked this mid-calf length black skirt with a netted outer layer that looked slightly gothic. "We will finish the outfit with the huge hat we have at home." "Ah! You can add long black gloves!" Alright~ The outerwear looks like something you can actually wear to an event or function, so we dropped the gloves idea and decided the outfit shall be statement-y yet wearable. Woot! Celeste: Auntie this one how much? Aiyoh Nicole where got people bargain like that one??? In the end it was too expensive and would exceed our budget of $50. So the girls decided to wear something from home. I suggested meshed stockings with glam high heels. When Celeste tried on the clothes I was very impressed with the Anita-Superstar outfit we came up with. May the force be with us! I WANNA GO BACK TO HONG KONG!!!!!! Good Luck to All at Singapore Blog Awards 2011!